A weekly update for MuckRock's open source community. Later this week, we’re revamping how you manage your account and site features to offer the ability to be a member of multiple organizations, more easily add and remove members, and a lot more. In preparation for the upgrades, the site will be down Friday from 10 a.m. Eastern as we migrate data. 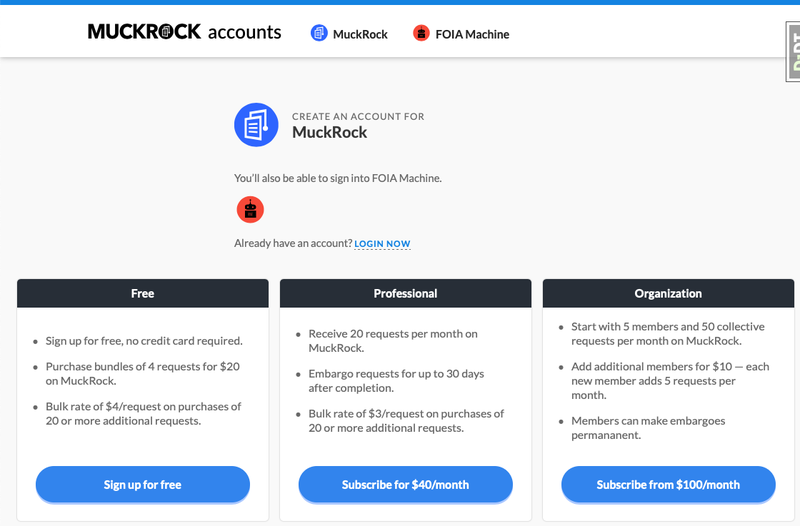 For previous site improvements, check out all of MuckRock’s release notes, and if you’d like to get a list of site improvements every Tuesday - along with ways to help contribute to the site’s development yourself - subscribe to our developer newsletter here. Tentatively scheduled for Friday, we’ll be launching a new service to help you log in and manage your account. This service will still live on the same domain, but it will look a little bit different than the rest of the site, as you can see above. 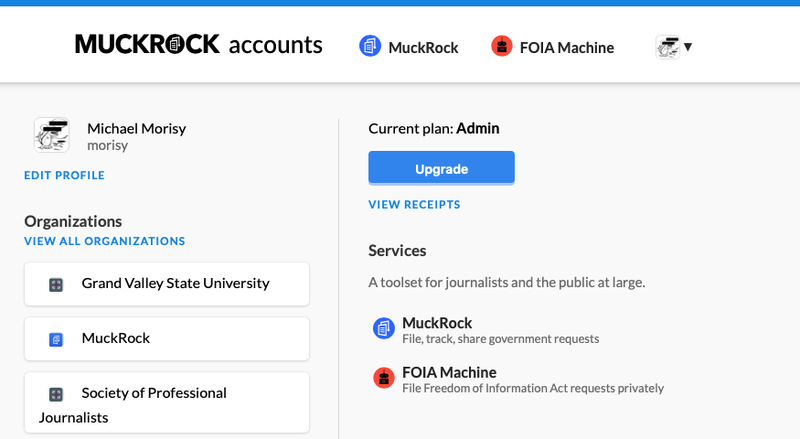 Right now, it will help you log in to both MuckRock and FOIA Machine, with DocumentCloud and our other services coming as they’re updated in the following months. You’ll see this new service when you log in or go to manage your account settings, including organizational settings and payments. There’s a lot of new features to explore, but we tried to keep the service as simple as possible. Some of the highlights are below. Thanks to feedback from users, we’ve made some changes in terms of how we handle user accounts and some profile fields. Take a look at past receipts, including an overview of payments made as well as copies of the detailed receipts. This will not be retroactive, but we’re always happy to manually pull up older receipts as requested. You can still customize which email address(es) get copies of receipts as they’re generated. Some of the biggest changes are related to Organization accounts. It’s now easier to manage existing users and invite new members. You can now have multiple admins for a given organization. Users can now be members of multiple organizations at one time. You can now send people an invite to join your organization by just dropping their email address in the “Invite New Member” field at the bottom of your organizational page. You can now let users request to join your organization from your Organization page, and then approve or reject those requests. If you’re a member of multiple organizations, you can now easily swap which one you’re working in by hovering or tapping your profile picture on MuckRock.com. We’re excited to finally launch these new tools — some of them have been on the drawing board for years, and the new account management tools will help us going forward with integrating our other services. The scope of this upgrade requires some site downtime, which is currently planned for Friday at 10 a.m. Eastern and should last for less than two hours. We’ll keep you updated on the site status via Twitter and Facebook. If you’re the kind of person who gets excited about the construction of little digital toys like this, you might also be interested in our Tuesday meetups in Cambridge, Massachusetts, or our other open source efforts. There’s a number of ways to help us continue to improve the core MuckRock site experience. We have a project and a weekly newsletter, “Release Notes,” that highlights everything we’re working on. Register to get a summary of site updates each week and details on open issues you can help with. Check out some of our issues labeled “help wanted” for ideas on where’s good to start, or just pop into our Slack’s #Developers channel. Subscribers to the weekly newsletter get exclusive data sets, FOIA-related scripts, and other transparency hacker tidbits exclusively for subscribers. You can subscribe to to the newsletter at the top or bottom of this page. If you spot a bug or have a feature request, you can also help by opening an issue on GitHub. If you do, please search open issues first to make sure it hasn’t already been reported. If it has been reported previously, please leave an additional comment letting us know it’s an issue for you, particularly if you can provide more details about when it crops up or what you think is causing the problem. In addition to the new newsletter, we have a developer channel on the MuckRock Slack.